I am working on a breakup/cause havoc spell for my ex(child's father) and the girl he cheated on me with( and they are still together which infuriates me!! ). A few months ago I did the freezer spell on her to freezer her out of his life, but that doesn't seem to have worked. I also did a vinegar jar on them that I shake occasionally. I just had some goofer dust delivered and wondered if I could add it too my vinegar jar. In my jar I have photos of them not facing each other that I ripped of them apart, I do want in my child's life( although he doesn't help with my child at all financially, mentally and he's seen her twice - she's 4!) I want him to leave that girl, even if it's not to be with me that's fine by me! I'm angry at them both, him for cheating on me and walking away from me n child. Her for getting into the situation knowing fully well he had a pregnant galfriend and had the nerve to taunt me on social media(woman bringing each other down). Payback is a b***** and I intend to make her feel it! Any suggestions are appreciated, don't hold back! I don't not know their address unfortunately, I do know her DOB, and have pics. I don't not have any personal concerns of either. I personally would not put that in the jar it may hurt him too. It's better if she walks on it, touches it, etc. and wouldn't hurt him if he did the same because laying out Goofer Dust is different because you can state who it is intended for. Yes, you could do that with the jar but the enclosement is what bothers me. Take care and have fun. Goofer Dust is awesome. I am curious to know as I am in a situation with "neighbors from hell" evil: so to speak. I want them to move far far away however; they have made our life a load of mishap and bad luck so I want all that neg. send our way right back as they can't help but to move far far far away. As in her case they are buying the home and we own ours so it is tough; neither one of us wants to back down and we can't move right now because of debts we have. I am trying to be sly about it but it is hard to do in an urban HOA community.. they have cameras everywhere and so it is really hard to do.. I would like to lay tricks but even at night this lady has security lights all over her front yard area. Her backyard would be ideal however the backyard door is really far away. I couldn't just throw it over my fence and get it on her back porch. She sweeps a lot too.. any ideas would be great. I am a empath so using any neg. tricks seems to rub on me some and cause me to feel sick..
Do you have a dog? You can take the dog for a walk, act s if you're picking up poop and lay down tricks. You can make a dirt ball of goofer dust and throw it on their property. You can trick a package or a letter. So what if she sweeps her back area? just keep throwing it. And do some spell work at home. Use her dirt to represent something that is a part of her. Thank You for your help. I am working on trying to do a freezer jar spell with her and her husband as he is just as much a part of it.. She pushes him to play along. What's worse is he is a cop I love your ideas and they help a lot. I only wish that I could get my stuff I ordered from Lucky Mojo asap. It has been over a month since I ordered it.. Kinda bummed out because it is taking soo long.. I can only do so much to ward off her evil ways and bad juju at us.. I have had nothing but bad luck since they started hating us and now my husband's job is at stake.. just bad luck right and left.. I just want to use the freezer spell to stop it all being directed to us. Hope I get it soon. I thought for sure they would have mailed it off. Do you do readings?? If not, is there someone through the website that does that you recommend? I probably need a reading to make sure I am choosing the right path to finally stop all this nonsense they are doing to me.. Again, Thank You! Oh, also Miss Aida.. I did use some goofer dust but I wanted to know if it can backfire back onto you if you get some on yourself.. ? I was preparing the stuff and got some on me as I was mixing it.. My foot started to hurt and hurt for a while then my husband got a notice that his job was possibly ending at the end of summer. I accidentally spilled a few bits on his motorcycle gloves. though it was not intended for either of us; could this be a backfire of it?? 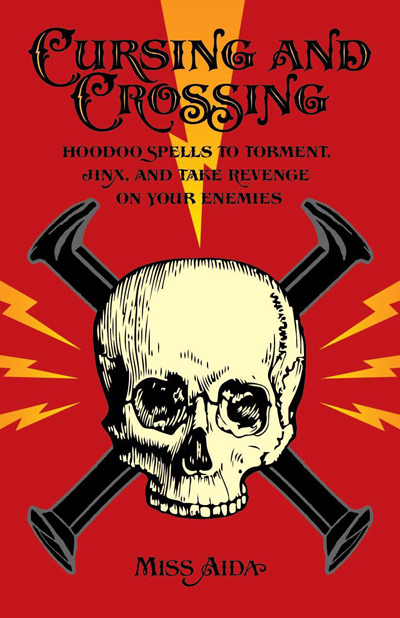 The concept of spellwork backfiring does not exist in hoodoo. The worst that can happen is that spells simply don't work. The goofer dust won't have affected you or your husband since your intent was for it to work on another person. That said, you should always cleanse yourself after doing any kind of cursing work. This is an important habit to get into, and a hyssop bath will help clean you up afterward. Protection is also important, so that someone you're throwing for doesn't reverse your work back to you. If you're having a run of bad luck and feel that you have some kind of spiritual mess on you, a thorough cleansing is appropriate. Get some Chinese Wash to clean out your home and do a 13 herb bath (for you and your husband) to rid yourself of any spiritual gunk that might be getting in your way. Athena K has given you EXCELLENT advice! A photo of the person with their name written on the back, placed between to small 3 x 3 inch mirrors, (the mirrors having previously cleansed, and also being very careful not to look into the mirrors myself), the mirrors facing inward, also with goofer dust on the photo between those two mirrors. Then wrapping the mirrors tightly, securely and completely with black yarn. Then burning a black candle on that mirror/yarn packet. Then taking all that and burying it in a grave yard. Question: In the opinion of those much more knowledgeable and/or experienced in such matters, what results may I expect to see as a result of this piece of work? If you get a chance (and wish to do so) please introduce yourself on the introduction subforum. Yes, sounds like an excellent idea! I like it a lot! Thank you for your reply. This is the first time I have posted on this forum, although I have really appreciated the information and advice that is available here. I will try to find the introduction sub forum to say hello and introduce myself. I'll be in the home of someone I want to cross up. I have goofer dust and am thinking of sneaky ways to spread it through the home without being noticed. Do you all have any thoughts, tricky ideas of laying this in the home? Does it have to come up through their feet? Or, could the mess just be placed in the home? I'm also going to anoint myself with fiery wall of protection because this person (family) has been throwing negativity at me as well. I've read a few recommendations on here; spread on the walk way, sprinkled in handsoap (a rootworker told me this one), their shoes - if I can access. Anything else? Also, what do I do to get this stuff off of me at the home? I'm scared of just sitting there all evening with remnants of goofer dust on my hands. the traditional way is to spread it in snake patterns in the yard or where they will walk, or an x pattern where you spit in the middle and call down a curse on them. That being said many ways it can be used some examples: Mix it with the dirt from their footprint to curse them, burn a photo of them and mix the ashes with the dirt, sprinkle where they will walk to curse them, put in their shoes of course. Afterwords I would cleanse with hyssop . that is traditional. Thanks for your response Miss Aida, I will read the link you mentioned and see what I can use from there. I spread goofer dust on my enemy's property, a dash in their home, as well as some hot foot powder and hot foot oil in their home. All Lucky Mojo products. I stated my intent with each trick. Now we wait. I'll let you all know if it worked! Sounds like you laid down some GREAT tricks!! How much exposure to goofer dust would it take to make somebody really ill? And what kind of vigil would be best to back up the work? The extent to which you can affect someone with goofer dust has less to do with the volume of exposure vs. your intent, energy and skill in performing magic, not to mention whether the work is justified. In the right hands, a little can go a long way. If one isn't meant for the work, or it isn't justified, no amount of goofer dust will make someone ill. Depending on the nature of your cursing, several vigils could back you up ranging from a simple Crossing vigil all the way to DUME. You might want to contact MISC and explain your situation and have them advise you on the correct backup lights. How exactly do you use goofer dust? The thread on goofer dust doesn't say, it does tell you how to keep yourself safe when using it (I ordered plenty of LMCC hyssop bath crystals for that). In this case my Aunt is using it on her boss and has access to her office and personal effects, food, etc. I assure you this is not a case of bitterness over being passed over for a promotion or something relatively petty like that , this woman (her boss) is treating her like a slave calling her to come in at any time 24/7 and using her company cell phone like a leash, she often has to go in every single day of the week and had to work thru Labor Day and when she's home they have her working on her laptop. Before this new boss she worked a regular. 9 to 5 job, now her boss can have her work whenever she wants because my aunt has no union to protect her like most of her coworkers. Her health is suffering . What precisely should she do with the goofer dust? Did you look at the webpage? I wish people would be more careful with this substance,I noticed some people got sick from handling it, this is definitely not for novices, highly toxic. ??? If I pour the powder dwn let's say in someone's car or rug, how long is it good for? Example: your neighbor is gone for two weeks but ask you to water the plants a week before they return, will it lose its effectiveness the longer it sits? I once added some goofer dust to a bottle of lotion and gave it to someone as a gift. Every time I smell that lotion on them, I notice a little movement. As long as you speak the name of your target when you lay the powder, the trick will be waiting for them! If you call someone's name into a mess and set it for them to contact, it can lay dormant for quite a while. Not forever, of course, but for a while. Should I pay attention to the moon phase or day of the week when deploying goofer dust and/or hot foot powder? You can and many worker we do, yet many also do work when it's needed and opportunity is their . If using this product I assume it's a big serious deal and I would work it when I can, and repeat during the moo. Phase that would support it. Example a person is hurting a family member I'd use it right now on the person then when moon is Wayne is use it again . J82 and ThomasK are both correct. But if there's an emergency, I don't care about moon phases. I've seen mention of using goofer dust in a love spell, but how exactly does that work. Does one just deploy it with intent? Please give me the forum links to using goofer dust in love spells. A few paragraphs down. I've seen it mentioned in a few other places, too. I wouldn't recommend using Goofer Dust for this purpose unless you are very experienced. Thanks for the advice, I'll definitely listen to it. I'm curious, though, what are the risks? Is it likely to hurt the person? That's definitely not my intent. 1) I have read about Goofer dust being used with intent, and read about it used with love spell stuff the "love me or die" one, but can it be directed? 2) Can you use a photo ( I can not fly halfway around the world and track this person down to lay it in a footprint) and direct the goofer dust with a "if you (their name) do this_____ then you will become sick until almost death. If you ( their name) keep doing ____ then you will be emotional destroyed, you will lose your health and good looks, you will lose your money and any love you have for ____ will turn to hate"? 3) Or do you have to just use intent that the person will become sick and or die or have black luck, and lose love? 4) And would you write out this wording on the back of the photo or just say it aloud? Goofer Dust is part of the community-based work of hoodoo in which direct physical contact is essential. That is why it is sprinkled in a foot track. Goofer dust is also used in conjunction with physical concerns or tokens as proxies of a target to influence the target in a negative way (to die). Goofer dust can be used by an adept practitioner, via physical concerns, to curse someone to death so that you can nurse him or her back to health, as a sort of faux love spell -- the "love me or die spell," as it is called. 1) I do not know what you mean by "can it be directed?" If you are asking, "Is it traditional in hoodoo to use Goofer Dust in the absence of physical contact or in the absence of a proxy of the target?" the answer would be "no." Death spells generally require some sort of link because people cling so tightly to life. 2) A photo can be a link or proxy. But, again, this particular item, Goofer Dust, is connected to foot track work primarily, not to the use of photos. 3) Intent is not a type of folk magic. Most folk magic, no matter from what culture, uses active contact, physical concerns, or proxies. Even a culture's utilization of verbal curses go beyond intent. Intent is strictly mental. 4) Both, usually, if you are good at the work. But, one more time, you are taking a spiritual supply designed for, best known for, and long used for physical contact work, particularly through the feet, and you are telling me why you hope to use it without contact, without physical personal concerns, and possibly without even a photo, just with "intent," maybe not even with written words, just spoken speech. To me it seems like you would just as rather intone a verbal curse. Why bother purchasing Goofer Dust? I am not saying you are wrong in what you are asking, but i am saying that we go to a lot of trouble to make Goofer Dust with real ingredients and sufficient ooomph to offer it as a serious help for home practitioners and professional conjure doctors who wish to engage in enemy work in the African American rootwork tradition -- and it might be a waste of your money to purchase it if your only plan is to say a verbal curse over a photograph. For 15 years now I have had goofer dust suggested to me I am thinking of sending something in the post to her I have to be extremely careful she is very suspicious and nothing passes her I wouldn't t be surprised if it went through forensic. You can wear gloves (but Miss cat doesn't like it when root workers wear gloves). Thank you so much you have been really helpful and I really appreciate it I'm going to have a look I have serious work to do I will keep you posted. I argue with the father of my child a lot and I am so sick of him to the point where I want to finish him. I want to know will goofer dust work, if I throwed it on him while arguing with him? I take him to work sometimes and I will love to pour it on him before he goes to work. That way he will wear it for 8 hours. Sentbylove...this thread mentions many times that Goofer dust is a foot track trick. If you pour it on him, then he is going to notice that he has a lot of powder on him! Sprinkle it in his path so that he walks through it...that's what foot track tricks are! I agree with Lilith Moon...Goofer Dust is powerful when used as foot track magic. You do not want it noticed by your target, you want to be discreet. Put it where you know he will walk, or lightly dust the insoles of his shoes if you have access to them. Pray for what you want when you do this. Question? I live with the intended target. Can I put some Goofer Dust in between the mattress where they sleep? I know it sounds crazy, but I want to employ in every way possible to create long term, and permanent effects.Can I put it in the cigars they smoke? Wallet? How will these things affect them or will it effect them? Thank you! You want your target to come in physical contact with Goofer Dust, preferably through foot track work (see the posts above). Yes you could put it between their mattress, but better to put it into their shoes. 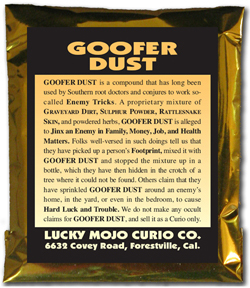 Do NOT put it in the cigars they smoke...some of the ingredients in Goofer Dust are toxic if ingested and you don't want them inhaling that. You could lightly dust their wallet, inside their shoes, on the floor in front of their bed where they will step bare footed, etc. As to how or whether it will affect them, that is only for God to know. We can't predict such things on this forum. Thank you Miss Athena, I'll use the food method I've read about. And I'll try the wallet, work clothes pockets. If they have to come in contact with it, I suppose under their fitted sheet will work to? Just guessing here. Hello all..i would like to know how to go about using goofer dust on someone? I don't have access to their shoes, yet I have access to other clothing of theirs. How does one package these types of powders, oils, etc to travel with? I would particularly like to do some work over the border in Mexico without having customs/Aduana in my face about what the ingredients are, or having my oils and powders taken away. This would be for travel by car crossing the border, not by air. Anyone had any problems? I don't know how other people do it. But, I buy those little plastic travelling bottles and put the powder in there and then put it in my makeup case. If asked (and I have NEVER been asked), I just say that its medicated body powder. I recently purchased Goofer Dust and Crossing Powder for my daughter's father. Long story short, he's a very wealthy, abusive man. He used the courts to take custody of our young daughter and she's been complaining of abuse. I was able to get a new Judge and new hearing, but I'm concerned he will manipulate and pay his way out of justice again. I have a lawyer BUT I would like to dress his subpoena with powders. Which powder is best? Do I use the Goofer Dust, Crossing Powder, or both? Thank you so much! Curse the hell out of that SOB !! Yesterday I came home from work. I live in an apartment building so I have to climb the stairs to get to my apartment. I noticed gray like shiny dust that looks like goofer dust sprinkled on all four flights of stairs and on each step. I thought it could be upstairs that did it but Im really not sure who did it and for what reason. But now whoever walks up the stairs is going to walk on it. Why would someone put it on every step and for what reason? I believe its goofer dust but not sure. What can I do to make sure my home and myself is protected if I stepped in it? Cursing and Crossing by Miss Aida! This is a classic in the making -- a compendium of more than 100 ways to jinx, cross, and generally mess up your enemies, written by Miss Aida, one of the Administrators here at the Forum, and a member of the Association of Readers and Rootworkers. There is an entire CHAPTER in this book devoted to Skull Candles. Every question you have will be answered! Oder now ! THIS BOOK SHIPS MAY 15TH. YOUR ORDER WILL BE HELD. While I certainly would do some kind of spiritual cleaning I would not panic or worry to much over this. Get some Uncrossing Bath Salts and and follow the instructions and you should be fine. On another note, in my own practice I would take this as a sign that the person I was going to throw for either has some good protections on them or maybe that the work is not really justified so you may want to perform or hire someone to do a divination in order to get some clarity on this situation.